Update: This living wall is thriving. I built a second design with an aluminum frame and removable potted plants and so far the plants prefer this living wall made with fishing net. This is a living wall experiment using a small prototype to test the concept. It’s easy to make and very low cost. Living walls can beautify your home, as well as add insulation, habitat for wildlife and reduce noise. In addition, plant covered buildings are very practical because they can save wall materials and finish work, reduce heating and cooling loads, and oxygenate air around the building. Just imagine your house enveloped in fragrant, colorful flowers, wonderfully blended with the natural environment. Construction details: We made our living wall out of fine mesh nylon fishing net about 150 cm long (5’). 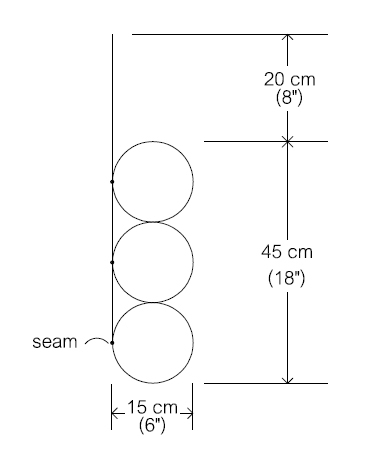 We have seams down the middle to create tubes, which are about 6” or 15 cm in diameter. We’ve filled each tube with potting soil, aged manure and coconut husks, and fastened it to the wall with aluminum channel, screws and plastic masonry anchors. Over the next 6 months it should be covered with plants. You could do this on the outside of your entire house or other large area. For covering large areas, it’s best to make in sections about 2’-3’ high so as not to strain the mesh near the attachment point. This living wall system was originally conceived for my Green House design. Note: This post was “Freshly Pressed” (selected as a favorite) by WordPress.com. Thank you WordPress and thank you for the best, free blogging system. We love it. Hi Owen, this is a great experiment and look forward to the video. Are you placing a waterproof barrier between the earthbag wall exterior and the living wall sections? If so, what are you utilizing in Thailand? Is this the situation where EPDM pondliner or polyethelene would be useful where it is available in other parts of the world? or ?? So far it’s just an experiment to test the basic concept. If this step works, then I envision placing these living walls against cement plastered earthbag walls. An interesting concept. One of the problems though with all of these “green” or alternative building materials and styles is that most urban, county or state building codes don’t know how to deal with them. You’ll either be told a flat out ‘no’ or have to go thru so much red tape as to make an inexpensive project not worth the effort. Most people in an urban environment will not be able to use this as part of a home structure – at least not in the West. The simple solution is to move to where there are minimal codes so you can build the way you want. There are hundreds of rural areas like this in the U.S. and many more worldwide. This is an awesome experiment to try! I can’t wait to see the progress. This looks like a wonderful project! I’ve seen similar ones on Instructables and Makezine. A question/comment though, do you think the sun might damage the nylon and make it fall apart? It’s possible, yes. That’s why we’re doing one small test panel. 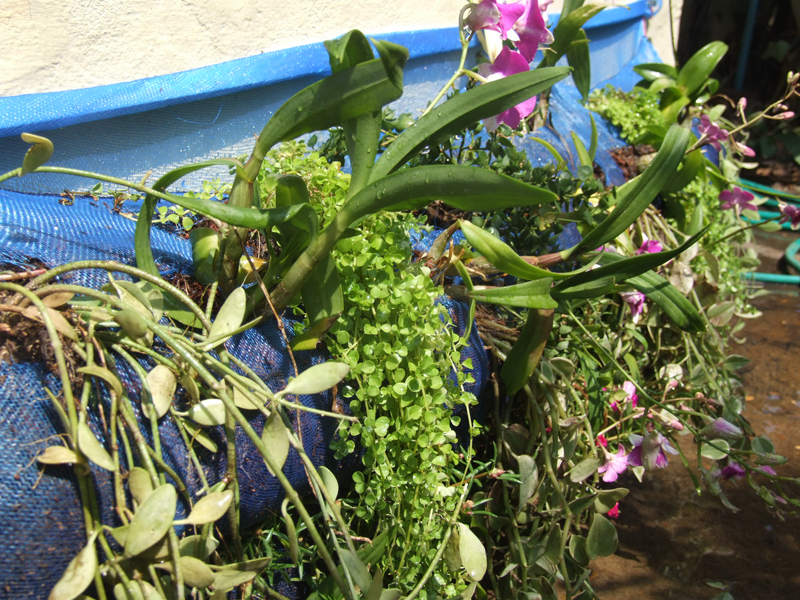 We’re hoping the plants cover the fishing net and protect it from UV damage. on October 29, 2010 at 8:22 am | Reply Kim K.
Very cool post – congrats on being freshly pressed!! I am going to forward this to a couple of family members that will all be interested in this topic. Thanks for posting will come back later to see updates. This is fascinating, and something I’ve never heard of. I wish you had included more photos! I will definitely do some reasearch about this. Thanks so much for posting. I had never considered this. It’s simply beautiful, and the benefits are incredible. My parents are currently building the home they plan to retire to. I’ll have to forward them this link. This is fascinating, I would love to live in a house like this! Wow, this is really cool! I love it when vines grow up building walls. But to have a wall like this inside a house would so amazing. Thanks for sharing! This one is outside, but yes, you could do this inside if you have sufficient light. And you touched on another good point — vines. You could plant vines in the ground around the house and train them up the walls. I think they are beautiful, but how do you manage the way they promote bugs and rodents? I’m happy to have lots and lots of flowers/living things everywhere, but friendly critters not so much. Think of it just like another garden, only vertical. The same horticultural techniques apply: encourage friendly insects that eat harmful insects, use plants that harmful insects don’t like (marigolds, etc.). You can find this info through Google. Congrats on being freshly pressed. I do have a couple of questions for you. What happens when a fungus attacks your plants? How do you remove a bag in the middle of the pile? What is the best way for going after a problem like that? The tubes are made in small panels as explained in the article. You could remove a panel if necessary. Or use standard horticultural techniques just like any other garden. It’s interesting to read about this. Such an interesting concept. Presumably this would only work in hot climates though…. ? Yes, it has limited application. Year-round growing climates are best. But you could plant native grasses, sedums and wildflowers and get it to work. This is such a unique effort. It’s great to see something so amazing being initiated… great work! I love living walls! There are some buildings with them inside here in Sweden. Every year at the conference complex with the yearly outdoor activities expo is one of them. It’s filled with non-native plants, but it’s still beautiful and about 20 to 30 feet of the corridor is floor to ceiling with vibrant plants. Sounds wonderful! Can you send a link to photos? THANKS for this because I was just at an “eco” store and they had this but they were liek $40 for a walled bag. No way! Now I can do it myself. Woohoo! Thanks. That was another motivation for doing this experiment. Other options I’ve seen are quite expensive. I have a great friend that told me about this. These are pretty awesome. “Living Walls”..!! Oh, I love this concept. Unfortunately, it would take a long time to be seen in India. However, I do have a query in my mind: Is its maintenance troublesome..??? Yes, there would be a fair amount of maintenance. I recommend starting off with a small area and gradually expanding. Experiment with different plants and see what works best. Thanks. Keep updating about the latest developments..!! Awesome post and site. Thank you. I will share your ideas with some likeminded folks in Alaska. Love the post… I’ve built a couple of living walls in Tenn…. These have been used for a “green” alternative to retaining walls, traditional erosion control methods, and slope landscaping…. I’m anxious to see future posts here… thanks. Hi Rod, which part of Tennessee did you build the walls? do you have any photos you can link to on the Internet? Awesome project… I’d love to do it! Thank you for sharing. So does this mean instead of repainting the exterior walls of the house every 10 years, that you just replant the exterior walls of the house every 10 years? Great informative post and congrats on being Freshly Pressed. Good point, thank you. The soil would only last so long and need replacement. Plus, the life expectancy of the fishing net is unknown. The whole thing may need replacement in 10 years. That was my question — how do you access the soil in order to amend it with nutrients, and how to you deal with “rootbound” plants? Still, I love the idea! We bought potting soil and amended it with coconut husks (very low cost) and old manure. That’s it. Some plants may not like this environment and would prefer to be in the ground. Start with a small area and see what works best. I love reading posts like this, about ways people are making the earth a greener place to live. Congratulations on being Freshly Pressed. Interesting. I don’t think I would like to put this on the house, but it might be quite nice to have as a fence, or a smaller area as a focal point for landscaping. If you put this on the walls of a house, would it cause the walls to rot? Good points, thanks. It may be best as a focal point in one area, yes. Put it against stucco walls so you don’t have to worry about rotting. Earthbags make great foundations. This is probably the fastest, lowest cost and most sustainable way to build foundations. They’re real popular with strawbale builders. awesome! this is the way to go! on November 1, 2010 at 4:54 am | Reply M.
The main moisture issue is resolved by building ‘eyebrows’ — protective overhangs — over doors and windows. They’re not shown here in order to simplify the drawing. Plus, eyebrows aren’t needed in dry climates. What you’re talking about is not an issue. This design uses 18″ thick walls of volcanic rock covered in plaster. This is a really cool idea. Living in London it’s pretty hard to imagine bag-building taking off here, but in so many parts of the world it’s so relevant. Little bit of unlearning is of great help to the mankind. Innovative and interesting concept. But a lot depends on the local climate. But, it’s worth a try. Do post about the progress. Thanks for the post. I agree that this basic concept would have to be adapted to the local climate. This is great for east and west exposures to keep the wall cool (evapotranspiration). We Moved to Naturalbuildingblog.com — Subscribe There!